It is a fact universally acknowledged that a reinforcement learning algorithm not in possession of a model must be in want of more data. Because they generally are. Joking aside, it is broadly understood that model-free RL takes a lot of data to train, and, even when you can design them to use off-policy trajectories, collecting data in the real environment might still be too costly. Under those conditions, we might want to learn a model of the environment and generate synthesized trajectories, and train on those. This has the advantage of not needing us to run the actual environment, but the obvious disadvantage that any model will be a simplification of the true environment, and potentially an inaccurate one. These authors seek to answer the question of: “is there a way to generate trajectories that has higher fidelity to the true environment.” As you might infer from the fact that they published a paper, and that I’m now writing about it, they argue that, yes, there is, and it’s through explicit causal/counterfactual modeling. Causal modeling is one of those areas of statistics that seems straightforward at its highest level of abstraction, but tends to get mathematically messy and unintuitive when you dive into the math. So, rather than starting with equations, I’m going to try to verbally give some intuitions for the way causal modeling is framed here. Imagine you’re trying to understand what would happen if a person had gone to college. There’s some set of information you know about them, and some set of information you don’t, that’s just random true facts about them and about the universe. If, in the real world, they did go to college, and you want to simulate what would have happened if they didn’t, it’s not enough to just know the observed facts about them, you want to actually isolate all of the random other facts (about them, about the world) that weren’t specifically “the choice to go to college”, and condition on those as well. Obviously, in the example given here, it isn’t really practically possible to isolate all the specific unseen factors that influence someone’s outcome. But, conceptually, this quantity, is what we’re going to focus on in this paper. Now, imagine a situation where a RL agent has been dropped into a maze-like puzzle. It has some set of dynamics, not immediately visible to the player, that make it difficult, but ultimately solvable. The best kind of simulated data, the paper argues, would be to keep that state of the world (which is partially unobservable) fixed, and sample different sets of actions the agent might take in that space. Thus, “counterfactual modeling”: for a given configuration of random states in the world, sampling different actions within it. To do this, you first have to infer the random state the agent is experiencing. In the normal model-based case, you’d have some prior over world states, and just sample from it. However, if you use the experience of the agent’s trajectory, you can make a better guess as to what world configuration it was dropped into. If you can do this, which is, technically speaking, sampling from the posterior over unseen context, conditional on an agent’s experience, then the paper suggests you’ll be able to generate data that’s more realistic, because the trajectories will be direct counterfactuals of “real world” scenarios, rather than potentially-unsolvable or unrealistic draws from the prior. This is, essentially, the approach proposed by the paper: during training, they make this “world state” visible to the agent, and let it learn a model predicting what state it started with, given some trajectory of experience. They also learn a model that predicts the outcome and ultimately the value of actions taken, conditioned on this random context (as well as visible context, and the agent’s prior actions). They start out by using this as a tool for policy evaluation, which is a nice problem setup because you can actually check how well you’re doing against some baseline: if you want to know how good your simulated data is at replicating the policy reward on real data, you can just try it out on real data and see. 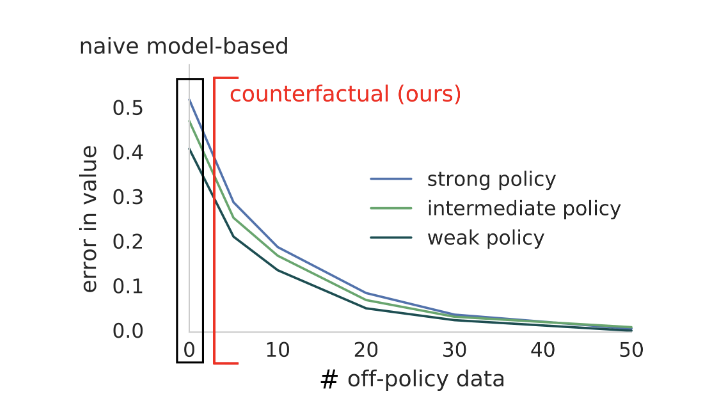 The authors find that they reduce policy reward estimation error pretty substantially by adding steps of experience (in Bayesian terms, bit of evidence moving them from the prior, towards the posterior).